In November, 2001, we were off to Brazil! Why? Because we live in Stockholm, and some people in Sweden consider November to be one of the worst and longest months. That’s the time when it starts getting darker and darker, colder and colder, and usually there is no snow to make it brighter. The good thing was that we had a cure for it: take a vacation and go abroad to a warm country. That year we chose Brazil, where Patricia’s relatives live. November in Brazil is great–it is spring and warm and sunny! We also had an ulterior motive for going to Brazil: to collect seeds for our balcony chile garden–see here. The streets of Salvador, Bahia. Our first stop was Salvador, the capital of Brazil for two centuries, before Rio de Janeiro became the capital in 1763. The city was founded in 1549. If you like churches, this is the place to visit. People in Salvador say there is one church for each day of the year. But that might be exaggerated–I think 150 to 200 is more correct. Still, that is quite a lot of churches. Salvador is also famous for its music. Astrud Gilberto, who sung “The Girl from Ipanema,” is from Salvador. Other famous musicians and singers from Salvador are João Gilberto, Caetano Veloso, Gal Costa, Gilberto Gil, and Maria Bethânia. Bahian food, or comida Baiana, as it is called in Portuguese, is the best food we’ve had in Brazil. You’ll find lots of coconut, palm oil, and seafood dishes here. Typical dishes are vatapá (palm oil, coconut, shrimp, and garlic), moqueca (seafood cooked in palm oil), caruru (seafood, in palm oil with okra), acarajé (deep fried bean cakes stuffed with vatapá), and abara (like acarajé but cooked instead of deep fried). 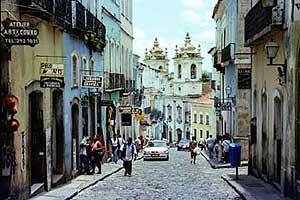 It’s a great experience walking around in the old city (Cidade Alta, Pelourinho) of Salvador. Thee are stunning views, nice bars, and good shopping. Going to the lower city (Cidade Baixa) we enjoyed the Mercado Modelo, with even more shopping, and Capoeira (the ritual fight from Angola) shows. In Mercado Modelo we found lots of handcrafts and canned peppers. But we were looking for fresh chile peppers that we could take the seeds from. So we left the Mercado Modelo for the food market where the locals go. To get there, we needed to take the bus. It was a 20-minute ride at high speeds. The best thing to do was to use both hands and hold on tight. At the market, we soon located the chile peppers. We found three different sizes of malagueta— small, medium, and large ones. Malagueta is the most common chile pepper in Brazil, and is used to spice up vinegar and olive oil to sprinkle on the food (see the recipe for Molho Malagueta). 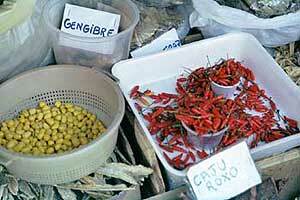 We also found cheiro (which means aroma) and one of our true favorites, pimenta comari. 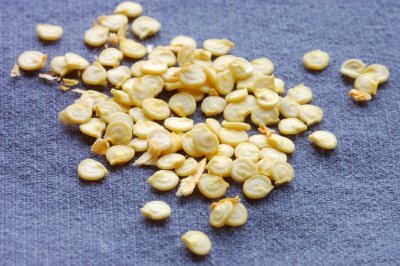 Comari (or sometimes cumari) is small and yellow when mature, and has a very nice flavor. Pimenta Comari at the market. We also spent some time in Recife, which is a one and a half hour flight north of Salvador. Recife is the capital of Pernambuco, and is sometimes called the “Venice of Brazil” because of the canals and bridges. In Recife we didn’t find any comaris, but instead one called cheiro do para, which looks similar, but is a little bigger than comari. 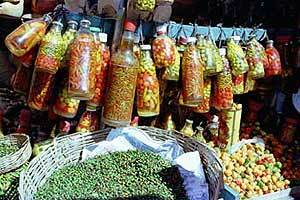 As in the market in Salvador, there are many different kinds of pickled chile peppers. Chiles and vinegar are the only ingredients you need. Cheiro do Para and malaguetas. The next stop was Brasilia, which might not be famous for its peppers, but rather for the architecture. The city was built from scratch in 1960, and it has the shape of an airplane. Governmental buildings are in the “cockpit,” and the residential areas are in the wing sections. The chiles power the plane, and in the large supermarket, we soon spotted the pimenta cambucy, which has an interesting shape, like a rocotillo. We also were fortunate to find pimenta ardida (ardida means spicy). Pickled peppers in the Mercado de São Jose in Recife. So, in addition to the great weather, beautiful beaches and fantastic food, the trip was also wonderful from a chile seed hunting perspective. By the way, we also spent some time in Rio de Janeiro but there we did not really search for chiles. 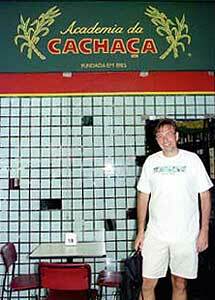 Instead we made acquaintance with the national liquor of Brazil–Cachaça. It’s made from sugar cane, like rum. And if you mix cachaça with lime juice and sugar you get a caipirinha, which is a great drink to enjoy those warm on Brazilian evenings. But of course, that’s a completely different story. If you can find some Cachaça, drink it while you prepare these fiery Brazilian recipes. Here is a basic Brazilian hot sauce featuring the malaguetas. It is simple, powerful, and can be added to any recipe to spice it up. Palm oil is traditionally used in this recipe, but it is very high in fat. Place the chiles in the wine bottle, add the vinegar and olive oil, and stopper the bottle securely. Place the bottle in the refrigerator and let the chiles steep for at least 2 weeks, shaking the bottle whenever you think about it. 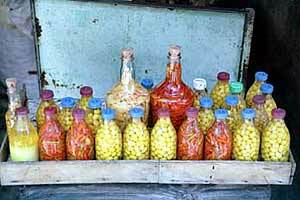 Farofas are Brazilian condiments made with manioc flour, which available in Latin markets. They are commonly sprinkled over the top of Brazilian meals such as Bifes (see recipe). Farofieros, those cooks who specialize in the preparation of farofas, have been know to make eighty or more variations. 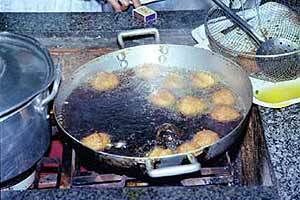 Heat the palm oil in a frying pan and fry the onions until golden brown. Add the hard boiled eggs and saute the mixture for 1 minute. Next add the chiles and and manioc flour stirring constantly until the mixture turns golden. Bifes are an English contribution to the great range of Bahian cooking. The English helped the Portuguese defend Salvador, the capital of Bahia, from pirates. This dish is the food of the Orixan god Exu–the Catholic counterpart is the Devil. Thanks for this recipe to Tita Libín, who has extensively researched the gods of Bahia. Tita’s recipe for bifes includes farofa ( see recipe), which is made from manioc flour and is used extensively in Brazil. Rub the steaks with the garlic and season with salt and pepper. Heat the oil in a skillet and pan-fry the steaks until almost done. Add the onions and chile and saute until the onions are soft. To serve, place the steaks on a plate, sprinkle with the lemon juice and top with the onion mixture. Sprinkle the farofa over the top and serve with rice. Unlike other areas of Central and South America, Brazil had no great Native American civilization, so much of the cuisine of the country originated with the Portuguese and the slaves they brought from West Africa. Nowhere are these influences more evident than in the cooking of Bahia. This dish probably began as a mixture cooked in a banana leaf, and, when the Europeans provided cooking pots, stews were born. A traditional meal includes white rice or a side of black beans, and okra with peanuts. A traditional malagueta sauce, such as Molho Malagueta (see recipe) is liberally applied. Combine the chiles, bell pepper, tomatoes, onion, garlic, cilantro, and lime juice in a blender and puree until smooth. Saute the sauce in 1 tablespoon of the oil for 10 minutes, stirring frequently. Allow the sauce to cool, pour over the fish, and marinate for an hour. Place the fish, marinade, the remainder of the oil, and a cup of water in a pan. Simmer the fish in the sauce until done, about 7 minutes. Serve sprinkled with Molho Malagueta. This recipe is typical of Bahia; it has the African influences of palm oil, red chiles (usually malaguetas), bananas, and coconuts. 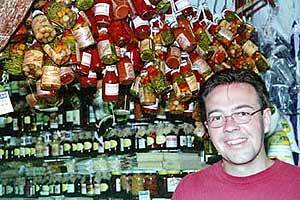 The food of Salvador, the capital, also plays a central role in Jorge Amado’s novels, including Doña Flor and Her Two Husbands. Vatapá is the food of Ogun, the Bahian Orixa of iron and war. The Catholic counterpart is Saint Anthony. Saute the fish and shrimp in the oil in a large pot oven until just done, about 4 minutes. Remove and keep warm. Add the green onions, onions, and ginger and saute until soft. Stir in the tomatoes and simmer for 5 minutes. Add the remaining ingredients, except the cilantro. Bring to a boil, reduce the heat and simmer, uncovered, for 15 minutes or until the sauce has thickened. Return the fish and shrimp. Add the cilantro and heat through. Serve with rice and beans.